Are you an artist or illustrator? Perhaps you enjoy brush lettering or calligraphy? Or maybe you simply love beautiful watercolor effects and are looking for a hassle-free (no spills) option that is great for travelling, or suitable for younger artists? Look no further than the latest exciting product to launch under trusted art brand Castle Art Supplies - their 24pc Water Color Brush Pens! The Nylon 'Real' Brush tip is like having a regular good quality paint brush, except with its own constant (and consistent) flow of beautiful water based ink. The design of the tip means that you can create fine, medium and broad brush strokes and the quality is such that it will bounce back into shape even after a heavy load of paint and/or plenty of use. "This set is so genuinely versatile you will wonder how you managed beforehand"
Ideal for artists, calligraphers, architectural designers, sketchers, colorists this high quality watercolor brush pens set makes an ideal gift because of their versatility and ease of use. And to make the set complete we've added a BONUS water pen to make blending, shading and mixing super convenient and mess free. Go ahead and add this 'must have' set to your art supplies - backed with the Castle Art Supplies 'Color Happiness Guarantee' you can buy with complete confidence knowing they will either replace or refund you purchase if you are not entirely happy with your waterbrush pens! PAINTING WITHOUT THE MESS! 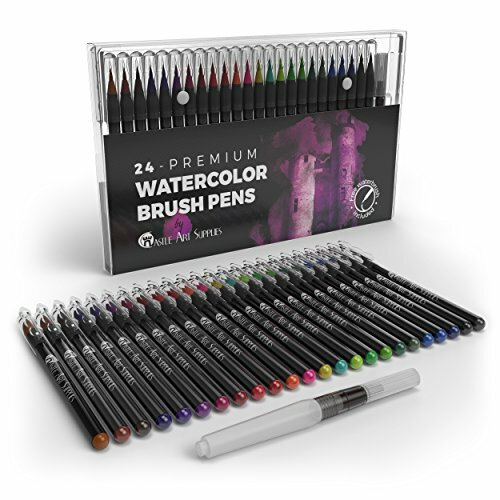 The 'ultimate' water brush paint set complete with 24 VIVID COLORS plus a handy case and BONUS water brush...make this exciting NEW PRODUCT from trusted art supplies brand Castle Art Supplies a must for all artists. CREATE BEAUTIFUL WATERCOLOR EFFECTS with these genuinely versatile brush pens featuring 'Real Nylon Brush Tips' that will also allow you to blend create color washes, gradients, ombre effects or simply layer to experience a deep, intense colorful result. ENJOY FINE, MEDIUM & BROAD BRUSH STROKES thanks to the high quality 'Nylon Real Brush Tips' that ensure you get the desired effect time after time - resilient to lots of use and paint loading these brush tips are excellent for brush lettering, calligraphy, and for adding fine details. COMPACT, VERSATILE & IDEAL FOR TAKING ON TRIPS... we've designed this set for your ease of use. This convenient set including BONUS water pen, is compact and ideal for on the go artists (of any age) - no mess, no fuss just relax and paint. RELIABLE, NON-TOXIC AND QUICK TO DRY these paints offer artists of all skill levels a smudge and streak free painting experience. They make the ideal gift for all artists - uses include; coloring, painting, creative lettering, designing and doodling. PLUS, like all products from Castle Art Supplies, the set comes with their exclusive MONEY BACK GUARANTEE... so order this fabulous set today and start your first Water Color Brush Paint Pen Painting today! If you have any questions about this product by Castle Art Supplies, contact us by completing and submitting the form below. If you are looking for a specif part number, please include it with your message.